Julia is a Speech and Language Therapist working as a clinical specialist in the neurology department at Kings College Hospital. She specialises in the management of communication and swallowing difficulties in people with progressive neurological disorders. She has carried out research into Speech and Language Therapy for people with Parkinson’s and is trained and certified to administer the Lee Silverman Voice Treatment programme (LSVT). Julia was a ‘Expert Advisor’ for the Parkinson’s disease N.I.C.E. guidelines published in 2006 and an Allied Health Professionals representative for the Long-term Conditions National Service Framework 10 year programme and research initiative from 2005–2015. She is an adviser for the Royal College of Speech and Language Therapists and carries out national and international lecturing on speech, swallowing and saliva management in people with Parkinson’s and other neurological diseases. 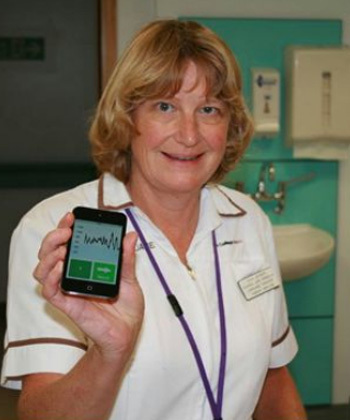 Julia and Professor Chaudhuri collaborated with the Creative Technology department at Portsmouth University to develop a special app that encourages louder speech. This ‘Speech Tool’ app is now available through the iTunes ‘app store’ and has proved very beneficial for people with Parkinson’s who have difficulty making their speech heard due to reduced vocal loudness. Nolan P, Hoskins S, Johnson J, Powell V, Chaudhuri KR, Eglin R. (2012). Implicit theory manipulations affecting efficacy of a smartphone application aiding speech therapy for Parkinson’s patients. Stud Health Technol Inform. 2012;181:138-42.